When my sister-in-law Annie was 14, she went to visit her grandfather who lived in a nursing home for Alzheimer's patients. She watched as the nurses there patiently talked to him and took care of him. Even at such a young age she knew that these women were angels. It was there and then that the seed was planted in her mind. She wanted to become a nurse. Originally she had planned to work in geriatrics, just like the angels who originally inspired her to seek this career path, but through her schooling she began to look into other nursing careers. At a career fair, she was offered a position at the local children's hospital where she still works today. Currently she works on the Airway Trach Telemetry floor with children who have respiratory and heart issues. It would be easy to list all of the ways that a nurse can make a difference in the life of a sick child: caring for them, helping to ease their fears, keeping parents informed about medications and treatment plans. But it is when she goes above and beyond her duties that I feel she makes the most difference. In her hospital, it is very common for many of her patients to be left alone during the day. The parents often have jobs they can't afford to lose and lack a support system that allows for someone to stay with their sick child during the day. Even at night, parents with other children to care for at home are unable to stay in the hospital overnight. As a mom, the thought of leaving my child alone in a hospital at any age is devastating, so I love to hear the stories of my sister-in-law spending extra time with those kids, rocking babies, singing to them, making sure that they have a movie that they enjoy and just sharing the personality that really makes her one of a kind. Capella University asked me to share Annie's story. Annie didn't attend Capella University, but they share the passion for work that makes a difference in the lives of others. You can hear some of the inspiring stories from Capella University graduates here and check out what their community has to say on the Capella University Facebook page. In honor of Annie and all of the nurses who work hard every day to make a difference, BlogHer will donate $1 for every comment left on this post (up to $500) to the Alzheimer's Association. So leave a comment letting me know about a nurse that touched your life, how you have been affected by Alzheimer's, or just a way in which you try to make a difference in the lives of others to help us reach our goal of 500 comments! You may receive (2) total donation entries by leaving up to two comments in response to the prompt on this post. This promotion is open to US Residents age 18 or older. The Official Rules are available here.This promotion runs from 8/27/2012 - 9/30/2012. Visit the BlogHer.com Capella page to check out more blogger stories and for more donation chances! My grandmother had Alzheimers before they knew how devastating it was. My great aunt is currently suffering from Alzheimer's and it us so hard seeing her not remember her husband of 60+ years. I thankfully don't have any personal experience with Alzheimer's, but I do have experience with how important nurses are! With my two babies (and tough deliveries), the cheer of the nurses made a huge difference. My first daughter was born three months premature & had to stay in the NICU for just over 3 months. We had a few nurses who asked if they could work exclusively with our daughter when they were on shift. We really got to know these nurses & it sure made a difference in our experience, knowing that they cared so much for her. I knew that when we weren't there that she was being taken care of as if by her parents. The nurses took the time to do the little things, to update me on what went on while I was gone & even take pictures of my daughter's "firsts" if I wasn't there to see it. Great nurses can definitely make a bad situation a little bit better! My grandma passed away from Alzheimers 2 years ago, and it was so hard to see this tough Marines lady became incapable of doing much of anything. A friend is struggling with her husband's early stages, of dementia, right now. It's a horrible disease! Thanks for doing this, btw!! What a terrible disease. 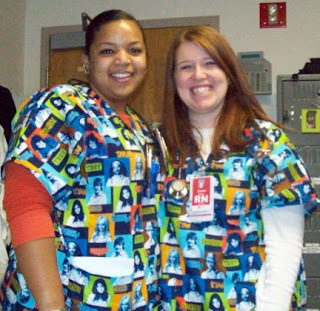 Nurses make all the difference in any hospital stay. There is no substitute for the love of an Alzheimer's caregiver. Two thumbs up for Nurses. My best friend is a NICU nurse and I know those babies are well taken care of when she is on duty. Thumbs down to Alzheimers which claimed my grandmother's life. I too think nurses are angels. To have such compassion day in and day out has got to take all you have emotionally. If the worls were just they would get paid like pro-athletes! As a nurse too,I know what it is like to care for alzheimer patients and their families. This is a great thing Capella is doing. Thanks! A few years ago my Mother had open heart surgery. The Nurses were just amazing and now every time I drive past the hospital where the surgery took place, I am so very thankful for the wonderful care my Mother was given. A good nurse makes a world of a difference. Doctors are lucky to have them. I'm a nurse whose life has been affected by Alzheimer's disease both personally and professionally- we recently lost my husband's grandfather after a long struggle with Alzheimer's. It is such a challenging disease. I hope that I am honoring his memory in my work- last night I stayed quite late at work to help a patient with Alzheimer's adjust to the transition from me caring for her to my co-worker taking over. She was extremely confused but so very thankful for the care we were giving her and kept telling us thank you. I thanked her for giving me the opportunity to care for her (and thus make a difference in her final years.) Thanks for the donation, BlogHer! My mother died from Alzheimer's-what a horribly debilitating disease for the patient, not to mention the toll it takes on the caregiver. Thank you for the donation! My mother died in July from old age complicated by Alzheimer's. She was in the middle to late middle stage. She still knew me, but couldn't remember most events. My best friend is a nurse and just recently switched from OB/gyn to home health and hospice. She says it's just a switch from helping people transition into the world to helping people transition out. She is a wonderful, caring woman and I am proud to know her. Thank you for sharing all of your stories about your experience with Alzheimers disease!! Keep them coming so we can donate $500 to finding a cure! My great grandmother had Alzheimer. This is a wonderful thing you are doing. A good nurse can make a huge difference! My grandma had this. So sad! It was as though she died twice. Alzheimers is a terrible disease. A close family friend suffered through it and it was terrible to watch her go through it. It's so great that you are doing this. My grandmother had Alzheimers, what a straining experience on the family and caretakers. Wish it could be solved! I serve on the Warroad Walk to End Alzheimer's committee because my boyfriend's mom has the horrible disease. We WILL find a cure! Our Walk was this past weekend ~ 500 attended and over $36,000 was raised so far! We are in a VERY rural area (less than 2,000 people) and are simply amazed by the support we receive. My Grandmom had Alzheimer's, she was an amazing, wonderful loving woman and my daughter's namesake. Thank you for raising money for the cause! Thank you for sharing this story, and thanks to Blogher for their generous donation toward such a worthy cause. Thank you so much for sharing this. Alzheimer's is a terrible disease. Some many friends are starting to struggle with this disease with their parents. It is heart breaking. So nice of you to do this. Such an inspiring story and a great cause. Thank you for sharing. <3 Christina at I Gotta Create! My husband is a hospice chaplain and I haven't met any of the nurses that don't love and care for their patients as if they were a relative- they are all so caring I could not pick one! My grandma had Alzheimer's. It is so hard to see someone slip away. Thanks for caring! My husband's mother was diagnosed with Alzheimer's when he was only 10 years old. He was the youngest of 7 children. By the time he was 16 she no longer knew his name or who he was. The disease affected my husband's family in so many ways and left a hole in all of their lives. This disease is such a horrid one...blessings to you! My grandmother and her family suffered from this disease...such a devastating disease. Popping back in to get another dollar donated- research is the key! What a wonderful service to others. This is a beautiful story. My mother in law is 96 and she has Alzheimer's. She was diagnosed several years ago, but has probably had it for a long time. We just didn't understand the signs. Two years ago we moved her into a nursing home, and I am so grateful to the nurses who take care of her. She doesn't remember everyday things, but she still knows us and remembers the past. For that I am very grateful. These nurses do a wonderful job helping her. It is wonderful that blog her is going to donate money. Thank you for posting this, and thank Annie for all of her hard work. This is so fantastic - thanks for sharing Lorie! My grandmother also had Alzheimer's. She passed right before I had my oldest child. I remember her asking how long it had been since my parents had died, when we were in our car on the way to dinner with my parents. It's tough to watch, so I have tremendous respect for the doctors and nurses who make that their job. I know that many of them get attached and that's what makes them amazing, but that's what makes the job hard, too. Thank you to all of them! And thanks to you for helping this money go to Alzheimer's Research! Found your bow tie tutorial on pinterest. Can't wait to try! I worked as an activities coordinator at a home for people with dementia for 3 years. I've been forever changed by all my residents taught me when so many thought they were loosing it all. Thanks for your support of Alzheimer's research! What a great way to raise money! I have never seen my great uncle because he has alzheimers and cannot travel that far. Thankful for caring people like, Annie!!! Such an awful disease that NEEDS more research. Hoping you get more comments! Nurse are angels in scrubs. I am amazed at their generous spirit. My uncle's (by marriage) father just passed. He had been "gone" from us for about 10 years. It was a difficult time for the whole family. Just saw that I could make a diffrence by making a comment,I have nothing but love for nurses and all they give of themselves! Have a wonderful day! My mom was stricken with Alzheimers before she passed away. The nurses at her care facility were wonderful. We are beginning to think that my husband's grandma is having symptoms of Alzheimers and how wonderful would it be to find a cure? If not for her, then for someone else's loved one. This is a great cause and I hope some good comes from it! Also, after having a few hospital visits myself, all I can say is, thank heavens for nurses! One of my best friends decided a few years ago to change her entire life. She went back to school to become a nurse. She inspires me every day that it is never too late to chase a dream! Great post. Nurses are so important. Thank You for sharing. Love to see so many comments on here. what a great thing you are doing. My mom worked in an Alzheimer's unit for years and years as a nurse. Watching the good and the bad of the disease taught me a lot as a teen. I still think of many of her patients all the time. What a great way to give back and help with research. Thank you for the post. I hope a lot is raised for Alzheimer's research! My father-in-law has Alzheimers. We were able to take care of him for two years while he lived with our family. It was learning experience for all of us! I hope they find a cure some day! Thank you for raising awareness and money for Alzheimer's research. Amazing! My grandmother is in a special nursing home for Alzheimers. She doesn't know who I am any more and it is beyond sad. Thank you for raising funds for this cause. I haven't had any experiences with Alzheimers but I admire the nurses and facilities who care for them. My paternal Grandmother had Alzheimers. It was so hard to watch this disease steal her mind and leave her a prisoner in her own body. When she finally died we all breathed a sigh of relief, her suffering was over. I pray for a cure, I pray for those who are suffering, I pray for those who are working for a cure to find it. Yay for raising money, nurses are amazing and this is a great cause!